On February 21, 2006, the American Society of Civil Engineers (ASCE) published “Changing Our World: True Stories of Women Engineers,” by professional engineer Sybil E. Hatch. The 256-page book features the engineering contributions of women. The author is a senior project manager for the marketing and communications firm of Convey, Inc. of Berkeley, California. ASCE plans to distribute the book to school libraries and counseling centers. The purpose of the book is to use real-life stories to give young women and their parents a new perspective on engineering careers. ASCE’s executive director Patrick J. Natale, P.E., said that diversity is not simply about appearances, but also can be seen in the way that children are raised and taught. He noted that the book was the result of teamwork on the part of the ASCE diversity committee, which was formed to help challenge the status quo. He praised the author and her team for their passion and vision, and for producing the book in a very short time period. Out of the ASCE diversity committee just a few years ago, a special project group was created, known as the Extraordinary Women Engineers Project (EWEP). Representing nearly 60 engineering organizations, the EWEP served as a coalition for government agencies, corporations, professional societies, and universities. The goal of the partnership was to provide encouragement for young women to realize their full potential. Dr. Patricia D. Galloway, P.E., a past president of ASCE, was the chair of the steering committee for EWEP. One of her goals was to convince employers that a diverse workforce is a stronger workforce. Galloway recently received the Key Woman in Energy Award from the Energy Leaders Council, headquartered in Lakeside, Ohio. She is the chief executive officer of the Nielsen-Wurster Group, Inc., which is an engineering and management consultant firm in Princeton, New Jersey. Galloway is also the chief executive officer of Nielsen-Wurster Asia-Pacific, a subsidiary in Melbourne, Australia. She is the former master program scheduler in a $1.6-billion project to address water pollution in Milwaukee, Wisconsin, and she is a visiting professor at the Harbin University of Science and Technology in China, and at the Kochi University of Technology in Japan. She is a former president of the New York and Wisconsin sections of the Society of Women Engineers. About the new book, Galloway said, “Our dream has finally come true. This book is part of a project that will inspire young girls to consider engineering as a career.” The book may be purchased on line through www.pubs.asce.org, and more information is available about the EWEP through www.engineeringwomen.org. A quick look at gendered involvement in urban planning and regeneration will reveal that, despite some subtle shifts such as an increase in women gaining qualifications in areas such as surveying and architecture (though not consequently entering those professions, it seems – see Clara Greed’s article on women and surveying in the previous edition of this newsletter), it is still women, in the large, who cannot ‘afford’ to get involved in regeneration and renewal projects, either as beneficiaries, or as decision-makers in regeneration planning bodies. Gender – the social and cultural identities and differences that males and females learn and reconstruct over their lives – lies at the heart of many issues that urban planning and regeneration works to tackle. Housing, transport, education, health and crime – in all of these areas men and women feel the impacts of programmes in different ways, yet when gendered needs are not considered regeneration targets can remain untouched and, ultimately, the daily struggles of local people continue. For example, Oxfam partner the Beacon Women’s Network in Manchester pointed out to transport planners that the lack of bus service between deprived estates where they lived made it impossible for women to take up job opportunities. Across the UK, more women than men live in poverty in deprived neighbourhoods. Women have on average lower incomes than men, are more likely to be carers, are more likely to use public transport, and while they are in the majority in community groups, women are less likely to be involved when it comes to making decisions, planning, and implementing the social and civic projects that will impact profoundly on their lives. Meanwhile, men are at greater risk of violence in the street, face greater obstacles to accessing services for parents, and are more likely to be in long-term receipt of incapacity benefits. In addition to the marginalisation of women and certain groups of men, transgendered people are rarely even acknowledged (despite some changes in legislation in the UK such as those relating to employment and the workplace ), much less considered in terms of their distinct experiences and needs. Knowing all this, it seems clear that urban planning and regeneration cannot be effectively addressed if these gendered barriers and differences in experience are not taken into account. The upcoming UK Public Sector Duty on Gender (part of a raft of measures to accompany the new Commission on Equalities and Human Rights) will specifically address the need for public services to positively promote gender equality and take steps to prevent gender discrimination in the communities they serve. As the Duty comes into effect in April 2007, planners, service providers and regeneration practitioners across the UK are now looking at the practicalities of how to promote gender equality within their policy, planning and programming work. As back up to the Duty, guidelines are being developed by the Equal Opportunities Commission, and projects like Oxfam’s ReGender are running practical workshop sessions and mentoring support for public, voluntary and community sector workers, with experienced gender practitioners on hand to assist organisations with this change in legislation. While a significant new development like the Duty represents an opportunity for change in the way that urban renewal and regeneration programmes are designed and delivered, the work for equality in this area has been ongoing for some time. London-based organisation Women’s Design Service have been working with architects, planners, and communities for almost twenty years to address the gendered issues inherent in planning and urban renewal, and with past projects looking at topics as diverse as cycling and transport to safety in parks and the roles of disabled women in regeneration, there is clearly a broad landscape of possibility when it comes to exploring gendered needs and the ways in which they can be more effectively met through gender-aware planning and renewal. A critical starting point in the process is the understanding that just as there needs to be higher representation of women and trans people in planning and architectural professions, this same need for greater representation exists at higher levels in regeneration and civic renewal bodies. Furthermore, commitment is needed from professionals in urban design and renewal to actively involve their end-clients – local people in their areas of work – throughout the process of design and through to the final delivery and evaluation stage of projects. Without this commitment, urban renewal and regeneration processes will continue to deliver below their potential, leaving the benefits of effective and informed urban planning out of reach and inaccessible to those who are still unable to afford it. The case study below illustrates how local women’s input can improve the design of local facilities, and when accompanied by advocacy to local regeneration partnerships, can make a real difference to the effectiveness of urban renewal and regeneration practice. Greater Govan is a very diverse area of inner-city Glasgow, home to 28,000 people and a large proportion of ethnic minorities and refugees. It is also an area of high deprivation and poverty. There are few opportunities for young people and there was no women’s group. In 1999 Greater Govan was designated as a Social Inclusion Partnership (SIP) area with the aim of tackling some of these problems and making the area a better place to live in. In 2001 the SIP began work with Oxfam’s ReGender project, which supported and trained a group of grassroots women in Greater Govan. The group used gender analysis to look at how urban regeneration money could be spent on improving and developing green areas in Greater Govan to ensure that women benefit. They considered facilities and developments that would be needed in four of the local parks, which at that time were not meeting the needs of the local women. Initially the group came up with facilities that were related to their roles as parents, such as children’s play areas and an indoor activities area. They did not separate their needs from the needs of their children. To help focus on their own needs, they thought about what childless women may want and need in the park. As a result, they came up with a list that would better ensure this category of women would also benefit. 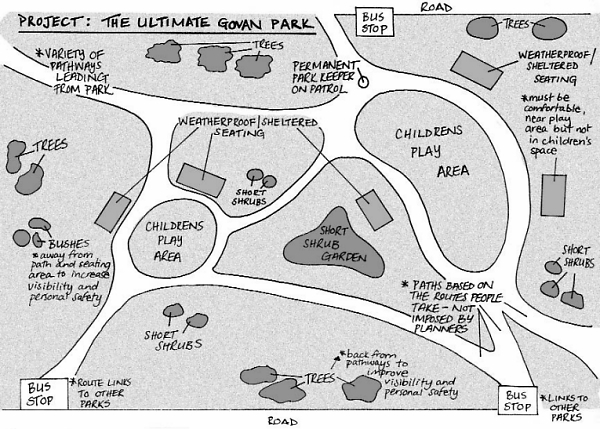 The list of facilities included safety features such as improved lighting, broader pathways based on the routes that people take (not on those that the planners decide), open spaces, weatherproof seating areas that are near but not in children’s play areas, and improved transport links between parks. The result is a park plan that, rather than being based on assumptions or design conventions, has been drawn directly from the experiences of the women, making it more accessible and relevant to the local population.